Mr. Troy Todd has over twenty years as an educator in the Howard County Public School System, with thirteen years as a school based administrator. Mr. Todd began his teaching career at Dasher Green Elementary school in Columbia, MD. He then went on to Worthington Elementary School in Ellicott City, MD. Mr. Todd was honored to serve as Assistant Principal and then Principal at Running Brook Elementary School in Columbia, MD for the past thirteen years. Prior to becoming a teacher, Mr. Todd earned a Bachelor of Science in Elementary Education from Morgan State University and earned a Master in Education from Loyola University. 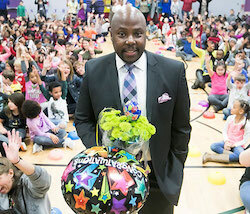 He has held various leadership positions in Howard County and as a teacher proudly earned the National Council of Teachers of Mathematics (NCTM) Math Teacher of the Year award, and was also named the 2017 Washington Post Distinguished Principal of the Year for the Howard County Public School System. For his steadfast commitment to the community, Mr. Todd was named the 2017 NAACP Platinum Award recipient. When he’s not watching the Eagles play football, Mr. Todd loves to travel, spend time with his wife and son, and play basketball. Mr. Todd is so excited to begin a new journey and combine all of his unique academic endeavors, and life experiences to help build and create a model educational program at Hanover Hills Elementary School, which will be dedicated to helping each student reach their fullest potential. Mrs. Harmon was born and raised in Mobile, Alabama. After graduating from the University of South Alabama, Mrs. Harmon taught at an elementary school in Atlanta, Georgia for two years. In 2003, Mrs. Harmon moved to Howard County and began her career with HCPSS. She worked in a variety of special education programs at Waterloo Elementary for five years before becoming a Resource Teacher with the Department of Special Education. After six years of being a Resource Teacher and traveling throughout the county, Mrs. Harmon transitioned into being the Assistant Principal at Bollman Bridge Elementary in Jessup. Bollman Bridge has been Mrs. Harmon’s home for the last four years. She is very excited to begin her fifth year as an Assistant Principal at Hanover Hills Elementary and her 16th year in HCPSS! Mrs. Harmon thrives on building relationships with students and families and has been recognized by the Howard County Special Education Community Advisory Committee for her dedication and support of students with disabilities. Mrs. Harmon lives in Ellicott City with her husband and two daughters. She enjoys spending time outside with her family, traveling, and cooking in her spare time. Mrs. Harmon looks forward to being a Hanover Hills Husky and meeting all of the students and families!